Got trouble with aliens? Call the Alien Hunters. 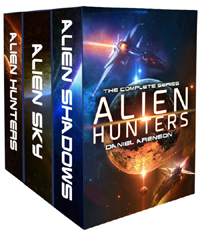 A group of scruffy mercenaries, the Alien Hunters travel the galaxy in their starship, a mechanical dragon that spits out plasma like dragonfire. If an alien has invaded your space station, asteroid mine, or Martian colony, the Alien Hunters will remove the pest for you. Low rates. No questions asked. Alien Hunters -- a new space opera for fans of Star Wars, Firefly, and Guardians of the Galaxy.